New band Hop Along certainly rocks, mostly due to lead singer Francis Quinlan's sharp, pained voice that sounds as if it's going to shatter into a million pieces at any second. Terrific new album. I'm not sure what else can be said about indie darling St. Vincent that hasn't already been printed in every music publication and online web source. Being a local girl Dallasite certainly helps in the exorbitant praise, but her latest track called "Teenage Talk" (from her self titled 2014 release) is simply brilliant songwriting that encapsulates so many moods, sounds, emotions and remembrances that it plays like a musical memoir. Don't let her icy, choreographed stage presence scare you away. Just listen and absorb. French filmmaker Henri Verneuil hit his stride in the late 60's and early 70's with a trilogy of films including "The Sicilian Clan" (1969), "The Burglars" (1971) and "Le Serpent" (1973)..... highly entertaining (and star studded) "policiers" that have yet to find their due in widespread distribution here in the States. The Austin Film Society recently included "The Burglars" in a repertory screening under the auspicious title of "The French Connection", but that's the extent of Verneuil's impact on American screens. Even though I love the frenetic pace of "The Burglars"- in which Omar Shariff and Jean Paul Belmondo engage in one of the finest car chase sequences ever put to film- Verneuil's "Le Serpent" is the better film of the bunch.... a cerebral, coolly detached spy tale that spends much more time on the diagnostics of a lie detector test than the various dead bodies that wash up along European shores. Like John Huston's "The Kremlin Letter"- which also trades in skulduggery without a hint of pretension- "Le Serpent" details the carousel of double crosses, political innuendo, 'spyspeak' and Cold War fixations with an icy gaze. It's only fitting that, in the finale, when head spook Henry Fonda makes a swap with the Russians to bring back a downed Air Force pilot, not only does the film's biggest enemy get off easily, but its prefaced with a line of dialogue where Fonda says the intel of the American officer in "explaining just how the Russians were able to shoot him down at 30,000 feet" becomes more important than anything we've observed over the past two twisting, convoluted hours. I can only imagine this nonchalance is apt par for the course in the world of high stakes spy games. Beginning with the defection of KGB agent Yul Brenner, his information to the Americans (and namely Fonda) sets in motion the devious wheels of "Le Serpent". His intel- that there are highly placed spies in all echelons of governments around the world- kick starts a series of murders, wearisome eyes and urgent secret memos in both France and America. Philippe Noiret is one such agent cast under suspicion. British officer Dirk Bogarde, seemingly with his fingers in every cookie jar, plays both sides. Fonda is unsure of Brenner's real intentions. And all the while, bodies of agents turn up dead, others go missing and seemingly innocent photographs belie sinister intentions. 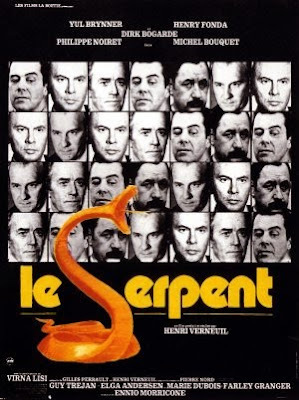 All of this is handled in Verneuil's no-nonsense approach, refusing to telegraph anyone's actual motive and creating a paranoid atmosphere where anyone could be "le serpent" working their magic to eradicate the others. I can't see "Le Serpent" existing in any other time period than the 70's. Echoing the later American thrillers of Sydney Pollack and especially Alan J. Pakula, "Le Serpent" is an arid exploration of the callowness involved in world politics. The basic sentiment of wanting our world to be safe, but not knowing just exactly how we make it so safe, continually runs through the veins of this film. It's a thriller, yes, but also a pretty frightening document of plausible denialability. Probably the pinnacle of Maggie's western attention came in her fourth collaboration with filmmaker Wong Kar Wai in the elegiac, heartbreaking "In the Mood For Love". 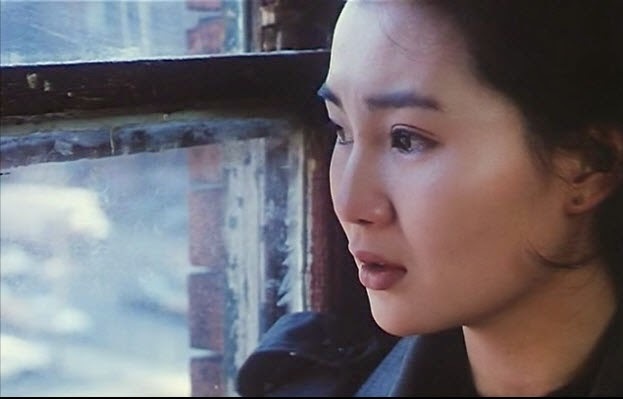 Widely hailed as a masterpiece, Cheung's performance is all body language, eye gestures, unrequited glances and slow soft finger movements to her mouth as she puffs on a cigarette. It's an extremely seductive performance. Set in 1960's Hong Kong, Cheung plays neighbor to Tony Leung, newly arrived at the tenement, and the two immediately form a sexual attraction, but decide not to pursue carnal lust since they're both married and their social structures (plus the confines of stifling moral code of the time) won't condone such a relationship. 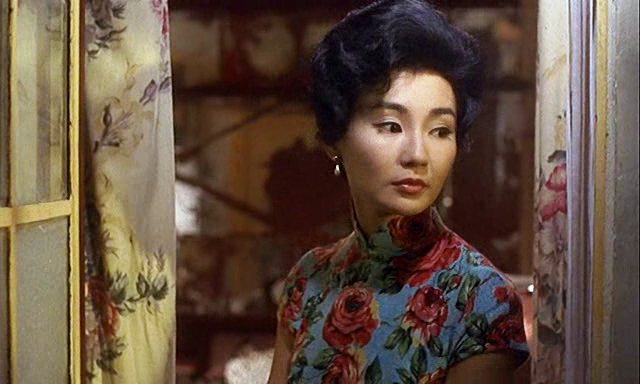 Filmed in dreamy slow-motion, which only heightens the beauty of both Cheung and Leung, "In the Mood For Love" is a two hour tease, revealing that its often much more powerful to portray repression than all-out passion. For fans of Cheung- or cinema itself, this is required viewing. Made just before Kwan's masterpieces of the 90's, "Center Stage" and "Red Rose, White Rose", "Full Moon In New York" feels like the blander companion piece to "Farewell, China"... as if the woman Maggie Cheung embodied in that film actually settled herself and carved out a respectable (and sane) lifestyle in the carnivorous city. The story here involves three women, including Sylvia Chang and I-Chen Ko, who become friends and bond while they deal with a series of problems ranging from an unhappy marriage to the pitfalls of couch-crashing in between acting gigs. Cheung has the juiciest role, though, as Lee, a lesbian flailing against her inner voices and falling for a real estate buyer in the meantime. 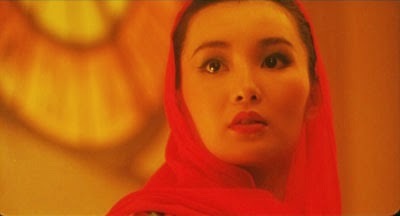 Although "Full Moon In New York" repudiates any explicit actions of homosexuality (instead lingering on a sole knee grab and an emotionally charged confrontation when her lover walks in on her kissing a man), Cheung does just enough to almost make one wish the entire film had focused on her instead of the marginally involving issues of the others. Sadly, "Full Moon in New York" didn't quite live up to my expectations- based on the few Kwan I've seen- yet it should be good for Cheung completists. Suspect title aside (probably from a broken translation or blurb I'm not familiar with), "A Fishy Story" stars Cheung and Kenny Bee as neighbors who struggle together during the 1960's. She wants to be a movie star and he simply wants to outlast the local riots and get back to earning money driving a cab. The film starts off unsure of itself, but, as it works towards its slightly cliched but tenderly rendered finale, it builds momentum. Cheung, resplendent in all hues of orange, gold and blue lighting,﻿ is again wonderful. Plus, its use of The Platters' "Smoke Gets In Your Eyes" predates its use in Hou Hsiao Hsien's tales by a few years and imparts the same woozy, atmospheric tone. 1. J.W. Coop (1971)- Continuing my intensive 70's viewing with Cliff Robertson starring (and directing) about a rodeo rider trying to regain his career. 2. Beyond Outrage (2012)- Underwhelmed by Kitano's oblique and glacial gangster-fest "Outrage", this sequel promises more of the same. As a Kitano completist, I need to see it. 3. The Best Offer (2013)- What happened to director Giuseppe Tornatore? Huge success with "Cinema Paradiso" and helped launch the career of Monica Bellucci with "Malena", yet his films rarely get US distribution. This one, seemingly a thriller about a recluse (Geoffrey Rush) rediscovering his passion with an enigmatic client (per the Netflix description), never made it on my radar. 4. Tim's Vermeer (2013)- Documentary that got quite a bit of buzz last year. 5. Two In the Wave (2010)- Documentary double feature about the nouvelle vague, following Truffaut and Godard. Right up my alley. 6. Memphis (2013)- I remember this ending up on quite a few best of lists in its respective year. Film about a singer wandering about the titular city. 7. Stranger By the Lake (2013)- Alaine Guiraudie's highly respected but risque experimental tale about a murder around a lake frequented by homosexuals. 8. A Grin Without a Cat (1977)- Chris Marker's essay about power struggles in the 60's and 70's. Marker is a highly intellectual filmmaker whose work sometimes goes right over my head. This film, originally released in the late 70's then removed and restored by Marker himself, is often regarded as one of his most influential films. 9. Marketa Lazarova (1967)- One of those Criterion releases that has one scratching their head. I'd honestly never heard of it before, but that's the outright joy Criterion often exposes in cinema. Described as a "poetic and stirring depiction of a feud between two rival clans". 10. Life Is Hot in Cracktown (2009)- Another film that has me shaking my head (like the Criterion above) but for wholly different reasons. I have no idea why its in my queue, but I see it stars Shannyn Sossamon. I went through a phase of loving her a couple years back so I can only guess this is residual affection for her. Hey, she plays a crack addict. Can't be THAT bad.